Vagus nerve stimulation (VNS) has emerged as a tool to induce targeted synaptic plasticity in the forebrain to modify a range of behaviors. This protocol describes how to implement VNS to facilitate the consolidation of fear extinction memory. Childs, J. E., Alvarez-Dieppa, A. C., McIntyre, C. K., Kroener, S. Vagus Nerve Stimulation as a Tool to Induce Plasticity in Pathways Relevant for Extinction Learning. J. Vis. Exp. (102), e53032, doi:10.3791/53032 (2015). Extinction describes the process of attenuating behavioral responses to neutral stimuli when they no longer provide the reinforcement that has been maintaining the behavior. There is close correspondence between fear and human anxiety, and therefore studies of extinction learning might provide insight into the biological nature of anxiety-related disorders such as post-traumatic stress disorder, and they might help to develop strategies to treat them. Preclinical research aims to aid extinction learning and to induce targeted plasticity in extinction circuits to consolidate the newly formed memory. Vagus nerve stimulation (VNS) is a powerful approach that provides tight temporal and circuit-specific release of neurotransmitters, resulting in modulation of neuronal networks engaged in an ongoing task. VNS enhances memory consolidation in both rats and humans, and pairing VNS with exposure to conditioned cues enhances the consolidation of extinction learning in rats. Here, we provide a detailed protocol for the preparation of custom-made parts and the surgical procedures required for VNS in rats. Using this protocol we show how VNS can facilitate the extinction of conditioned fear responses in an auditory fear conditioning task. In addition, we provide evidence that VNS modulates synaptic plasticity in the pathway between the infralimbic (IL) medial prefrontal cortex and the basolateral complex of the amygdala (BLA), which is involved in the expression and modulation of extinction memory. Classical fear conditioning provides a widely used animal model to study the biological basis of anxiety disorders. During fear conditioning, an aversive stimulus (the unconditioned stimulus, US, e.g., a footshock) is presented in conjunction with a neutral stimulus, such as a tone and/or a context (the conditioned stimulus; CS). During fear conditioning, associations between the CS and the US are formed. Eventually the presentation of the CS alone elicits a fear response (the conditioned response; CR). In fear extinction, the CS is presented repeatedly in the absence of the US, causing the CR to gradually diminish1. Thus, extinction of conditioned fear is an active process in which fearful behavioral responses to neutral stimuli are attenuated when they no longer predict aversive outcomes. Extinction of conditioned responses requires consolidation of new memories that compete with learned associations. A hallmark of anxiety disorders is impaired extinction2-4. Thus, extinction of conditioned fear in animal models serves as an important paradigm both for inhibitory learning and as a model of behavior therapy for human anxiety disorders5,6. Because there is close correspondence between fear and human anxiety, it is thought that these studies can provide insight into the biological nature of anxiety-related disorders such as post-traumatic stress disorder and will help to develop strategies to treat them. An important goal of preclinical research is to aid extinction learning and to induce targeted plasticity in extinction circuits to consolidate extinction learning. Vagus nerve stimulation (VNS) is a minimally invasive neuroprosthetic approach that might be used to provide tight temporal and circuit-specific modulation of brain areas and synapses engaged in an ongoing task. A series of recent studies from Michael Kilgard's group at The University of Texas at Dallas have shown that pairing VNS with discrete sensory or motor stimuli (e.g., a tone or a lever pull) is highly effective in promoting cortical plasticity to treat tinnitus7, or to overcome motor deficits following stroke8-10. In addition, non-contingent VNS that occurs within a short time-window after learning similarly promotes cortical plasticity and enhances memory consolidation in rats and in humans11-13. Considering the role of the vagus nerve in the parasympathetic pathway, it is not surprising that it could participate in modulating memories and synaptic plasticity. Highly emotional events tend to produce stronger memories than non-emotional memories. This is likely due to the influence of stress hormones on memory consolidation. Posttraining administration of the stress hormone adrenaline enhances memory consolidation in human and non-human animals, but adrenaline does not cross the blood-brain-barrier14, 15. Therefore, stress-induced adrenaline release must impact the brain indirectly to enhance memory consolidation. Strong evidence suggests that the vagus nerve may be the link between circulating adrenaline and the brain. Miyashita and Williams16 found that systemic administration of adrenaline increased vagal nerve firing, and increased levels of norepinephrine in the amygdala17. Systemic administration of adrenaline does not enhance memory consolidation when β-adrenergic receptors are blocked in the amygdala18 suggesting that the vagus nerve plays a role in the pathway that turns emotionally arousing experiences into long-term memories. Thus, pairing VNS with training has the potential to enhance the brain changes that support memory consolidation and exposure to conditioned cues in the absence of reinforcement enhances the consolidation of extinction learning in rats19,20. Here we describe the use of VNS as a tool to promote cortical plasticity and facilitate extinction of a conditioned fear response. All procedures described in this protocol are carried out in accordance with the NIH Guide for the Care and Use of Laboratory Animals, and they were approved by the Institutional Animal Care and Use Committee of The University of Texas at Dallas. Create a drilling tool by sawing off the sharp end of a 22 ½ G needle. Run the now blunt end of the 22 ½ G needle over a metal file several times to flatten it. Hold the needle at a 45º angle to the file and run it several times over the file while rotating it. This will cause the metal to become thinner and furl inward. CAUTION: Insert the tip of the scalpel into the cut end of the needle and rotate with some downward force to unfurl the metal. Use magnifying binoculars for the remaining steps in section 1. Using a scalpel (10 or 15 blade) cut 4 mm segments of tubing. Place one 4 mm segment over a small drill bit or other similarly shaped tool. This is to hold the tubing in place while it is being manipulated. Drill 4 holes into the tubing (Figure 1A). Holes should make the four points of a 2 mm by 2 mm square and should be clean with no rough edges. NOTE: The drilling tool needs to be resharpened (step 1.2) every 2 or 3 holes. Difficulty with this step is almost certainly due to a drilling tool that is not sharp enough. With the tubing still on the drill bit, use a scalpel to cut the tubing lengthwise between the holes so that two holes end up on either side of the cut (Figure 1B). Using a sewing needle and suture thread, pass suture through the holes to create the rigging for the ultimate placement of the cuff around the vagus nerve. Start with the needle inside the cuff and pass it through one of the holes, then go back through the adjacent hole from the outside (Figure 1C). Tie the thread together ~2 cm from the plastic so that the tubing and thread make a triangle. Allow ~8 cm of thread after the knot and trim. Repeat the process for the holes on the opposite side of the cut. The tubing is now ready to be wired. Cut platinum iridium wire into 70 mm segments. Using the finest tip for the jewelry torch, create a sharp flame with blue center that is as refined as possible and use it to strip ~1 cm of the plastic coating from the wire. Apply the blue center of the flame to stripped end of the wire to create a small ball. Apply the blue center of the flame to several points of the stripped portion to fuse the seven strands together. The wire in these spots will appear to kink. On the opposite end of the wire, apply the blue center of the flame to the end to create a small ball. Minimize stripping the plastic on this end. Wire the cuff (Figure 1D). NOTE: Steps in section 1.10 must be done under magnifying binoculars. Tape the cuff down using the threads so that it is oriented with the cut running horizontally. Pull the threads tight so that the cuff is pulled open and then tape down the threads. Grasp the balled end of the stripped side of the prepared wire with #5 forceps and push through the bottom right hole. Pull the forceps out of the hole, leaving the end of the wire in the middle of the cuff. Re-grasp the balled end of the stripped wire (now in the middle of the cuff) and push it through the top right hole. Pull the forceps out of the hole, leaving the wire passed completely through the cuff and loose on the top side of the cuff. Re-grasp the balled end of the stripped wire (now outside the cuff on the top side) and push it back through the top right hole from the inside. Continue doing so until the wire is securely in place: test by tugging on the opposite end of the wire. NOTE: During this process it is critical to differentiate the stripped/insulated portions of the wire. The wire that is ultimately positioned in the ‘trough’ of the cuff must be stripped, but everything below the bottom holes (outside the cuff on the bottom end) must be insulated. This ensures delivery of current only to the vagus nerve. Grasp the balled end of the insulated side and push it through the bottom right hole from the inside of the cuff, looping it around once. Repeat steps 1.10.2 – 1.10.5 on the left side of the cuff so that two wires end up fixed to the tubing, one on the right side and one on the left side. Place a gold pin into the arm of the helping hand with the hole facing up. Fill the hole with flux. Solder the insulated end of the wire (now attached to the cuff) into the pin. Allow the solder to cool, and then melt it again. This ensures a good connection between the end of the wire and the inside of the pin. Apply more solder if necessary. Repeat for second wire. With the leads running to the right, mark the top of the cuff with permanent marker. Also mark the gold pin attached to the top lead. Cut 30 mm segments of 26 AWG copper wire. Strip a small portion on each end. Cut the narrow end off loose gold pins and solder the stripped end of the wire to the cut end of the gold pin. Create two wire/pin compounds for each desired input site. Place a connector into the helping hands and solder the wire end of a wire/pin compound to the each of the two fluxed teeth of the connector (Figure 2G). Mark one of the wires with sharpie. During the surgery, position the implant with the marked wire rostral to the unmarked wire. Create custom glass tools for handling of vagus nerve during surgery. Use borosilicate glass to pull a micropipette so that it has a long tapered tip. If no pipette puller is available, break the glass to create a longer edge. Hold the non-tapered end of the pipette with a thick cloth (to prevent burns) and press the tapered/broken end into a smooth fire-resistant surface while applying the blue flame from the jewelry torch to the tapered end. The glass will bend as it is pressed into the surface. Apply flame until a hook or J shape forms. Gather and sterilize all tools. Prepare a sanitary, heated surgical area. Anesthetize animal with ketamine/xylazine (85 mg/kg, 5mg/kg, IP). Assess the depth of the anesthetic plane by monitoring the animal’s vocalizations and withdrawal-reflexes in response to toe and/or tail pinching. Shave the top of head and left side of animal’s neck. Protect the animal’s eyes with mineral oil or eye ointment. Apply iodine cleansing solution with gauze and then alcohol with gauze to the shaved areas. Repeat once. Inject 0.05 ml marcaine subcutaneously on the top of head and allow the bolus to disperse while placing the animal into the stereotaxic instrument. Use a scalpel to make an incision in the skin on the skull to expose both lambda and bregma. Prepare a path for the cuff by using blunt forceps to tunnel subcutaneously from the incision site down the left side in front of the ear to the left side of the neck. Pull the incision site open with hemostats. Using cotton swabs, apply hydrogen peroxide to the exposed skull to remove any remaining tissue. Using a scalpel, drill two shallow starter holes in the skull to place anchor screws. They should be placed far enough apart to allow room for the implant, but not too close to the surrounding tissue. Avoid placing screws directly on the midline. With forceps and screwdriver, drive a bone screw into both holes. The screws should be tight in the holes, with the caps 2 - 3 mm above the surface of the skull to allow room for acrylic to fill in under and around the screws. Fill the space under, around, and between the screws with a small amount of acrylic, avoiding the surrounding tissue. Then place a larger amount of acrylic in the middle of the skull between the two screws. Grab the implant so the marked wire is oriented rostral to the unmarked wire and quickly place the implant in the acrylic, taking care not to get acrylic into the gold pins, the clasp area, or the input site on top. Once positioned allow to set ~5 min until dry. This can also be done using the arm of the stereotaxic for support. Fill in any cracks or gaps between the implant and skull with a low viscosity blend of acrylic. Allow to dry. Use magnifying binoculars for the remaining steps in section 3.2. Remove the animal from the stereotaxic instrument. Place the animal on its right side, rotating it slightly toward the ventral position. Make a small incision approximately over the left jugular vein. The jaw bone and clavicle should be roughly equidistant to the incision site. Widen the incision using blunt dissection until the muscle layer is reached. The sternomastoid, sternohyoid, and omohyoid muscles should be visible. Use muscle retractors to keep the site open. Continue blunt dissecting along the natural furrows between the muscles. Look for the pulsing of the carotid artery. Heading through the muscle toward the pulsing will reveal the carotid artery. Pull the muscles back with the muscle retractor. The sheath containing the carotid artery also contains the vagus nerve. Carefully blunt dissect the sheath with the scissors. Identify the vagus nerve. It is the largest nerve in the carotid sheath and is usually to the animal’s left side of the artery but can be found on any side. Switch to the custom glass tools and separate the vagus nerve from the carotid artery. The nerve should be free of any other tissue for at least 5 mm. From the incision on the head, using the threads on the side of the cuff opposite the leads, pull the cuff through the previously made subcutaneous tunnel with forceps or small hemostats. Push it through the tissue into the incision site on the neck. Gently lift the nerve up using the glass tools and push the threads on the side of the cuff opposite the leads under the nerve. Pull the threads all the way through, taking care not to rub against the nerve. The cuff should be immediately adjacent to the nerve. Make sure the cuff is oriented with the marked ‘top’ side superior. Drop the nerve into the middle of the cuff. The nerve should now lie across both wires in the trough of the cuff (Figure 2B). Tie the threads together to close the cuff. On the headcap, plug the pins attached to the cuff into the gold pins on the stimulation input site. Plug the marked pin into the gold pin attached to the most anterior tooth on the simulation input site. To verify that the cuff properly stimulates the vagus nerve, perform a cessation of breathing test by, connecting the stimulator to the stimulation input site on the headcap and running stimulation (0.2 mA, 60 Hz, up to 10 sec). Breathing should briefly stop and heart rate should drop, verifying cuff function. Secure the pins on the stimulation input site with acrylic. Cover the wires and verify that exposed pins and wires do not lead to short circuits. Use acrylic to smooth over any bumps or to fill in any gaps. Allow to dry. Suture closed both incision sites. Inject 0.05 ml marcaine subcutaneously near the neck incision site. Apply antibiotic ointment to incision sites. Optionally, leave a male connector in place on the stimulation input site to prevent damage or obstruction during the healing process. Treat with antibiotic and follow standard post-operative care including appropriate analgesia. Return animals to animal housing facility after they regain mobility. Allow 5 days for recovery. To ensure maximal longevity and function of the headcap, house animals singly for the remainder of the experiment. NOTE: Sham-VNS rats undergo the same surgery, however the circuit is designed to short at the level of the headcap (i.e., a headcap is implanted and the vagus nerve is separated from the carotid artery, but no electrode cuff is placed around the nerve). NOTE: This fear conditioning protocol is more intensive than most21 because the goal of these experiments is to enhance extinction. With mild fear conditioning that is easily extinguished, a floor effect can obscure this enhancement. House animals on a 12 hr light/dark cycle with ad libitum access to food and water. Handle animals daily during recovery from surgery. Set up the conditioning and testing apparatus, consisting of an operant box housed in a sound-attenuated chamber (Figure 2C). The operant box has clear plastic walls, 20 x 20 x 20 cm, and has a stainless steel grid floor which is connected to a foot shock generator. Use a white house-light to illuminate the chamber for video recording. Use a 9 kHz, 85 dB SPL tone as the conditioned stimulus. Record behavior using a digital camera located inside the chamber, above the operant box. View and monitor the session on a computer located outside the behavior room. Save videos for later analysis. Wipe chambers with 70% ethanol before and after each session to eliminate olfactory cues. Fear-condition the rats for 2 days (Figure 3A). Confirm that the rats are not innately afraid of the tone by presenting 5 tones (9 khz, 85 db, 30 sec) on the first day. Ensure that the freezing levels are negligible. Follow the initial tone presentations with 8 tone-footshock (1 sec, 0.5 mA) pairings on each of 2 consecutive days. Repeat the tone-footshock pairings again on the second day. Vary the inter-stimulus-interval (ISI) between 2 and 4 min, averaging 3 min for every trial. Randomize the point at which the shock occurs during the tone. On the third day, test the strength of the tone/shock association. Play 4 tones with an ISI of 3, 4, or 5 min (4 min average) in the absence of footshocks and record the animals’ freezing behavior during the tone presentations and during the inter-stimulus-intervals as measures of the conditioned fear response (CFR). On day 4, begin extinction training with VNS or Sham VNS. Plug the rats into the stimulator by inserting the male connectors from the stimulator into the stimulation input site. Place animals into the chamber (Figure 2A, 2C). Set the stimulator to 0.4 mA, 500 µs pulse width at 30 Hz. Set stimulation to a total duration of 30.15 sec, starting 150 msec before the onset of the tone. Play animals 4 tones (as in step 4.6) and pair each tone presentation with VNS or Sham VNS. Periodically test the electrical integrity of cuff and input site using an oscilloscope. Plug the animal in as normal and split the output from the stimulator to the oscilloscope. Set the range on the oscilloscope as -20 V to +20 V and run stimulation. The waveform of the 30 Hz stimulation should be visible on the oscilloscope. Stimulations exceeding 10 V in size indicate high impedance and an improperly functioning cuff or connection at the stimulation input site. To test the effect of VNS on extinction training run a second CFR test (as in step 4.6) on day 5. Record the time spent freezing during tone presentations and compare to baseline freezing recorded during the first CFR test (step 4.6). Analyze the videos using an independent observer who is blind to the treatment conditions. Measure time spent freezing during tone presentations using a stopwatch. Freezing is defined as complete immobility, during which the rat exhibits rapid respiration, lowered head, and spread paws22. Analysis of freezing behavior can be split into two phases: during tone presentation and during the inter-stimulus interval. Note: This step is optional. Evoked field potentials (EFPs) are recorded 24 hr after tests of reinstatement (Day 5) in isoflurane-anesthetized rats mounted in a stereotaxic apparatus, following standard procedures23,24. Gather and sterilize all tools. Induce anesthesia with isoflurane (5% in 100% oxygen, flowrate 1l/min) in a clear plastic chamber. Assess the depth of the anesthetic plane by monitoring the animal’s vocalizations and withdrawal-reflexes in response to toe and/or tail pinching. Use mineral oil or eye ointment to protect eyes. Inject 0.05 ml marcaine subcutaneously on the top of head and allow the bolus to disperse. Use a scalpel and hemostats to remove the headcap from the skull. Use as little force as possible to avoid obscuring bregma. Place the animal in the stereotaxic instrument. Use a scalpel to widen the incision to expose both lambda and bregma. Maintain anesthetic plane with isoflurane (3% in 100% oxygen, flowrate 1 L/min) via a nosecone. Drill holes into the skull above the infralimbic prefrontal cortex (IL) and the basolateral amygdala (BLA). 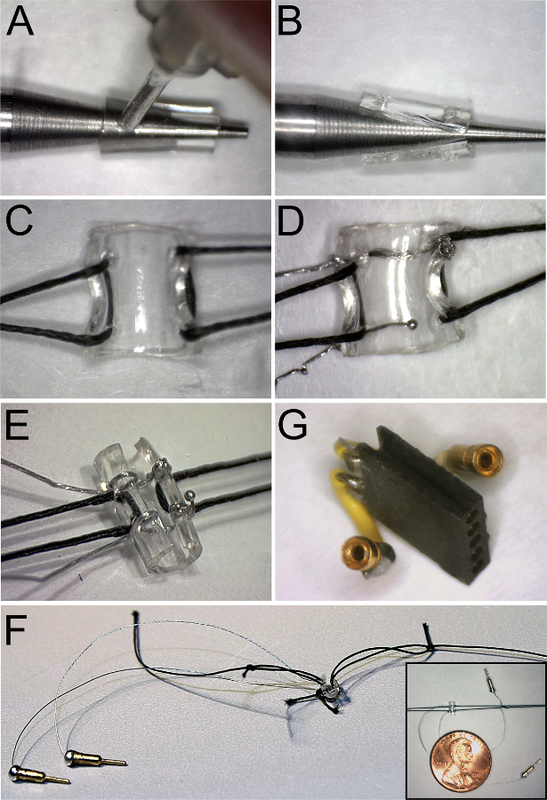 Lower a glass microelectrodes (2M KCl; 1-2 MOhms resistance) into the BLA (D/V: 7.2, A/P: 2.7, M/L: 4.9 from bregma) and a stimulation electrode into the IL region of the medial prefrontal cortex (D/V: 4.6, A/P: 3.0, M/L: 0.7 from bregma) (Figure 4A). Stimulate the IL to evoke EFPs in the BLA. Data shown in Figure 4 was acquired with the following settings: A stimulation pulse of 0.3 msec duration, using a stimulation intensity that corresponded to 40% of the minimum current intensity that evoked a maximum field response (based on an input–output curve determined before collection of baseline data), delivered every 15 sec. Collect baseline data for a minimum of 10 - 15 min before inducing synaptic plasticity. NOTE: The protocol used to evoke synaptic plasticity will vary with the requirements of the experiments and must be carefully selected by each experimenter. Data in Figure 4C shows changes in the EFP following 3 bursts of 100 pulses at 50 Hz (2 sec), with 20 sec inter-burst intervals at the minimum current intensity that evoked the maximum field response. Measure the amplitude of the EFP as the difference between the mean of a 5 msec window before the stimulation artifact and the mean of a 5 msec window around 20 - 25 msec after the stimulation artifact, corresponding to the negative peak of the field potential. Normalize data to baseline and set the average of a 10 min baseline as 100%. Use the averaged EFP amplitudes of another 10 min period after plasticity induction (e.g., 40 - 50 min post induction) to assess long-term changes in EFP amplitude. After the end of the recording decapitate the anesthetized animal and extract the brain. Prepare tissue for histological verification of electrode placement. This section illustrates examples of results that can be obtained by using VNS in combination with extinction learning to reduce the expression of the conditioned fear response in rats. 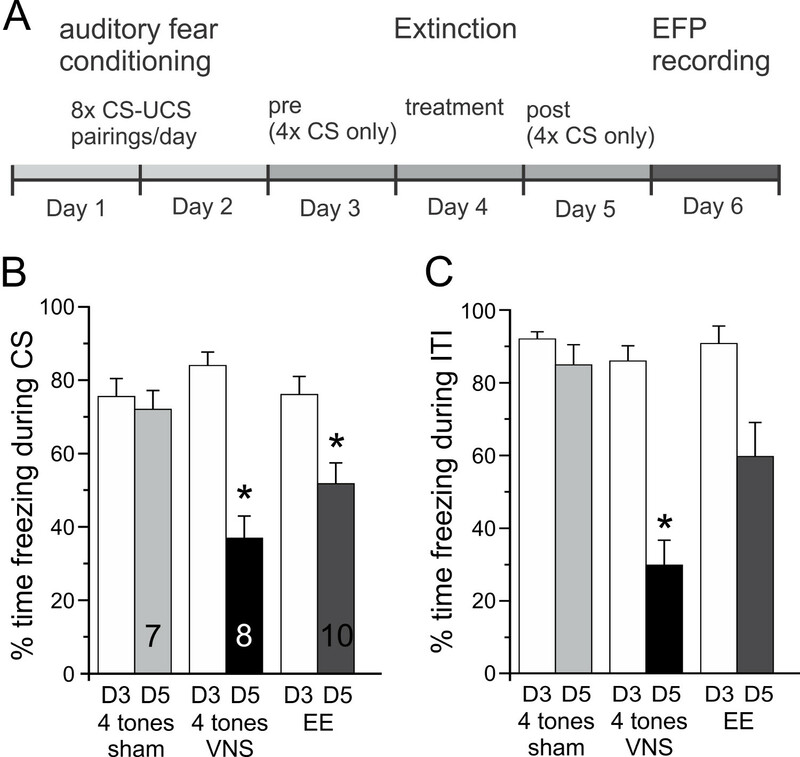 For Days 1 and 2 (Auditory Fear Conditioning), rats were trained on an auditory fear conditioning task in which footshocks were paired with a tone. On Day 3 (Pre Treatment Test), tones were presented in the absence of footshocks to measure freezing levels and infer conditioned fear response acquisition. On Day 4 (Treatment) rats received group-specific extinction training and treatment: 4 tone presentations were paired with either VNS or sham-stimulation or, in the extended extinction group, 20 tone presentations with sham-stimulation. Freezing levels were tested again on Day 5 in response to 4 presentations of the CS alone (Post Treatment test) (c.f. timeline in Figure 3A). Animals that received a limited number (4) of non-reinforced exposures to the conditioned tone during the extinction phase show only a small reduction in conditioned fear on the following reinstatement day (Figure 3B). In contrast, VNS-treated rats demonstrate a significant reduction in freezing after a single extinction training session (Figure 3B). The amount of reduction in the conditioned fear response of VNS-treated animals is comparable to that seen in sham-treated animals that received 5 times the amount of non-reinforced exposures (20 tones) during extinction training (group EE in Figure 3B). Using the specific experimental setup outlined above, VNS can also facilitate extinction to the context. As shown in Figure 3C, VNS animals also showed reduced freezing behavior outside the presentation of the conditioned tone, suggesting that their extinction training also generalized to the context. We also show that pairing VNS with extinction training alters the metaplasticity in the pathway between the infralimbic cortex (IL) and the basolateral amygdala (BLA) in anesthetized animals (Figure 4). In fear-conditioned animals which did not undergo extinction training, brief burst stimulation (HFS) of the IL induced LTD of the evoked local field in the BLA (Figure 4). Whether they were given extended extinction training or VNS during a single extinction session, this synaptic depression was reversed in animals exhibiting significant extinction of the conditioned fear; however, administration of VNS during extinction promoted induction of LTP while animals in the extended extinction group showed no change in response to HFS. This result was also observed in animals that were sham-stimulated in the four-tone extinction group. Importantly, VNS only altered the plasticity in the pathway between the IL and the BLA when it was delivered in an extinction context. In contrast, VNS delivered to untrained animals in their home cages had no effect on synaptic plasticity in the IL-BLA pathway (Figure 4B). Figure 1. Construction of Vagus Nerve Cuffs. (A) Placement of the 4 mm piece of tubing on the drill bit for stability, showing the use of a modified needle to drill holes in the tubing. (B) Holes have been made in the tubing, and the tubing has been cut down the middle. (C) Placement of the suture thread through the holes of the cuff. Note that the thread goes over the lip of the cuff. (D) Insertion of the platinum iridium wires to the cuff. Top shows completed wiring, bottom shows wiring in process. (E, F) The completed cuff with the gold pins attached to the end of the wires. See insert in (F) for scale. (G) Shows the corresponding headcap piece that gets attached to the skull during the surgery described in step 3. Please click here to view a larger version of this figure. Figure 2. Vagus nerve stimulation and experimental set-up. (A) Schematic of the set-up used for vagus nerve stimulation (VNS). Animals are connected to a stimulation isolation unit via a headcap from which 2 platinum-iridum wires lead subcutaneously to the custom-made cuff-electrode that is wrapped around the vagus nerve. (B) Placement of the cuff-electrode around the vagus nerve. Photomicrograph of the surgical incision and the exposed vagus nerve before the cuff electrode is sutured around it. 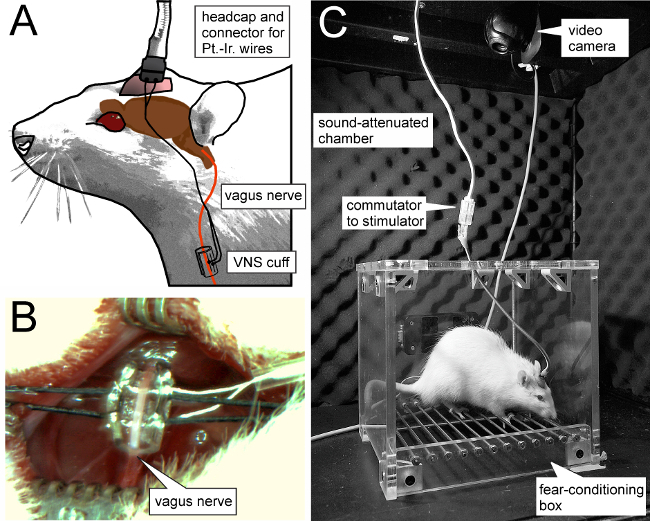 (C) Photograph of the setup used for auditory fear conditioning, with the animal connected to the stimulator. (Figure modified from Reference 20). Please click here to view a larger version of this figure. Figure 3. VNS enhances extinction of auditory fear conditioning. (A) Experimental timeline. 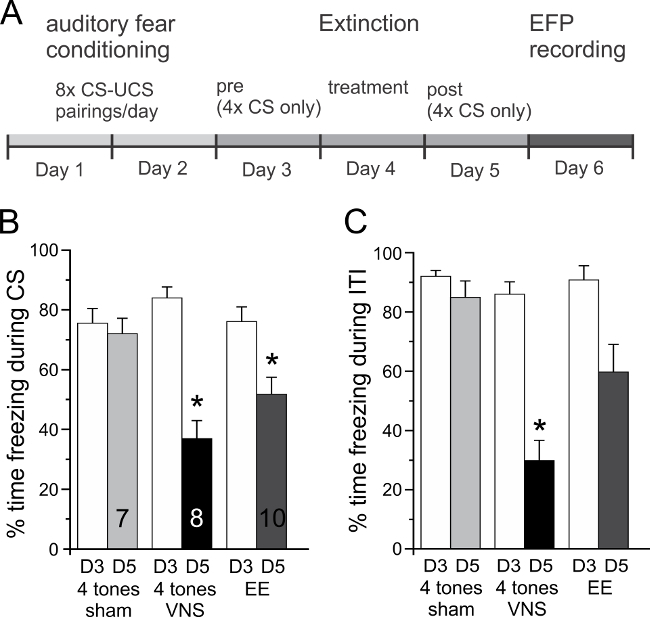 Days 1 and 2: Auditory Fear Conditioning, 8 tone (CS)/shock pairings (US) per day. Day 3: Conditioned Fear Test Pre, freezing measured during 4 unpaired tone presentations. Day 4: Treatment, 3 groups: 4 tone presentations paired with VNS, 4 tone presentations paired with sham-stimulation, 20 tone presentations paired with sham-stimulation (EE). Day 5: Conditioned Fear Test Post, freezing measured during 4 unpaired tone presentations. (B) Percentage of time spent freezing during presentation of the conditioned stimulus (CS) on Day 3 (D3, white bars) and Day 5 (D5) for the different treatment groups (4 tones + sham stimulation, 4 tones + VNS, and EE). After one day of extinction training paired with VNS (black bar) rats spent significantly less time freezing than sham controls. Freezing during the Post Test in the EE group (grey bar) was similar to freezing in the 4 tones + VNS group. (C) Percentage of time spent freezing during the inter-tone intervals (ITI) on Day 3 (D3, white bars) and Day 5 (D5) for the same groups shown in B. VNS animals also showed reduced freezing behavior outside the presentation of the conditioned tone. (* p < 0.05, error bars represent standard error of the mean). (Figure modified from Reference 20). Please click here to view a larger version of this figure. Figure 4. VNS alters metaplasticity in the IL-BLA pathway. (A) Representative stimulation and recording sites in the IL and BLA and representative traces of an input-output curve of field potentials recorded in the BLA following stimulation of the IL. (B) Synaptic plasticity in the IL-BLA pathway in response to short burst stimulation in 4 groups of rats. Top right: In fear-conditioned rats brief burst stimulation of the IL induces LTD in the BLA. Middle left: rats that received 4 tone extinction training with sham stimulation also show LTD. Bottom left: rats which received extended extinction training with sham stimulation show no change, or a recovery of the LTD that was induced in the fear conditioned only group and the sham stimulation group. Middle right: in rats treated with VNS during a single extinction session, synaptic strength is further potentiated, leading to LTP. Bottom right: VNS delivered in the home cage causes no change in plasticity. Abbreviations: IL, infralimbic cortex; PL, prelimbic cortex; BLA, basolateral nucleus of the amygdala, LA, lateral nucleus of the amygdala; CE, central nucleus of the amygdala. (* p < 0.05, error bars represent standard error of the mean). (Figure modified from Reference 20). Please click here to view a larger version of this figure. Figure 5. Simplified schematic of the brainstem innervation by the vagus nerve and second or higher order projections. Through its indirect modulation of monoamine nuclei in the brainstem, including the locus coeruleus (LC) and the raphe nuclei (DRN), the vagus nerve can modulate important components of the extinction circuitry, which include the prefrontal cortex (PFC), the amygdala (Amyg), the hippocampus (Hipp) and the nucleus accumbens (NAc). Please click here to view a larger version of this figure. We present here a protocol that is used to facilitate extinction of conditioned fear during a single session of exposure to conditioned cues19 and to modulate plasticity in the pathway between the infralimbic cortex and the basolateral amygdala that may mediate extinction learning20. A crucial step for the success of this protocol is the proper delivery of VNS during extinction training. Therefore, special care should be given to the construction of the cuff electrodes and the placement of the cuff around the vagus nerve. In the construction process of the cuff electrode it is important to ensure that the exposed portion of the wires are in the right place. Similarly, during the surgery, special efforts should be made to place the cuff in the proper position and to anchor it sufficiently in place so that the circuit between the cuff and the stimulator remains intact over the course of the experiment. The proper function of the cuff should be checked after the surgery (as outlined in step 3.2.20) and again after behavioral testing (as outlined in step 4.8). The mechanisms through which VNS modulates activity in the central nervous system are not fully understood. The cervical vagus nerve is composed of afferent sensory and efferent motor fibers in approximately a 4-to-1 ratio, respectively25. 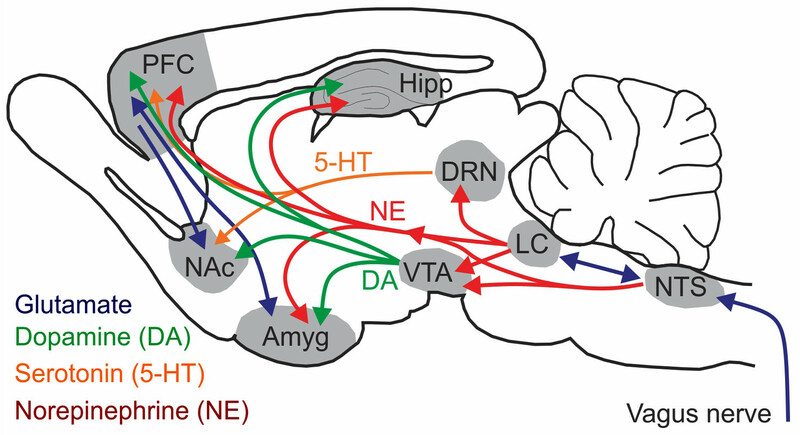 Vagal afferents relay signals to the nucleus tractus solitarius (NTS), which then projects to parabrachial nucleus, hypothalamus, thalamus, amygdala, and hippocampus26,27. Importantly, monoamine nuclei in the brainstem, the locus coeruleus (LC) and the raphe nuclei, receive direct and/or indirect projections from the NTS (Figure 5). Thus VNS may modulate cortical plasticity and memory via the synergistic action of multiple neuromodulators. Proposed effects related to vagal stimulation include alteration of norepinephrine (NE) release by projections from the NTS to the LC, elevated levels of inhibitory GABA, and inhibition of aberrant cortical activity by reticular system activation 28,29,30. Important roles for acetylcholine, serotonin, and brain-derived neurotrophic factor have also been shown 31-35. For the modulation of fear memories and extinction in general, the effects of VNS on transmitter release in the prefrontal cortex (PFC), the amygdala, and the hippocampus are likely to be particularly relevant36,37. Acute VNS increases norepinephrine and serotonin release in both the medial PFC33,38 and the amygdala39,30. Acute VNS also increases levels of norepinephrine38 and enhances synaptic transmission in the hippocampus40-42. Norepinephrine has previously been shown to be involved in the modulation of fear expression. Lesions of the NE projections from the LC to the forebrain impair the extinction of active avoidance without altering acquisition or retention of the original learning43,44. Consolidation of conditioned fear depends on β-adrenoceptor activation within the BLA43, and several reports suggest a role for both α- and β-adrenergic receptors in the medial PFC in memory consolidation of both drug- and fear-extinction training46-49. Thus, when pairing extinction training with VNS, the VNS-induced release of neuromodulators like NE or 5-HT appears to facilitate the synaptic plasticity that results from training alone, leading to enhanced consolidation of extinction. A major advantage of VNS lies in its temporal and spatial specificity. Unlike systemic or even local drug application, which often have a slow onset and offset of action, VNS can be selectively paired with specific behaviors to facilitate synaptic plasticity in those active networks that regulate the behavior of interest. We describe here a VNS protocol that uses parameters also used clinically for the treatment of epilepsy in humans (0.4 mA, 500 µs pulse width at 30 Hz, stimulation cycle of 30 sec on and 5 min off). Microdialysis experiments show that VNS using these parameters leads to a long-lasting, roughly 2-fold increase of NE release in the amygdala39. This large and relatively slow increase in NE may explain why VNS paired with extinction training, unlike extended extinction training by itself, also facilitated the extinction of freezing behavior outside of the presentation of the conditioned stimulus (the intertrial interval). Because in our experiments animals underwent extinction training in the same context as the auditory fear conditioning, the reduction of freezing behavior during the ITI indicates that VNS facilitated generalization of extinction learning to the context. However, despite the potentially long lasting effects on NE release, effects of VNS on behavior or synaptic plasticity are only apparent when they are paired with a specific behavior. Application of VNS to rats in their homecages shortly after fear extinction training did not facilitate extinction20, and similarly, VNS applied outside of a specific behavioral context did not alter the synaptic plasticity in the IL-BLA pathway (c.f. Figure 3C). On the other hand, even brief applications of VNS (e.g., 0.8 mA as a train of 15 pulses, 100 µsec pulse width at 30 Hz for 500 msec) cause specific and long-lasting changes in sensory or motor networks when they are delivered contingent with ongoing behavior. A seminal paper by Michael Kilgard’s group7 showed that the temporally precise pairing of VNS with the presentation of a single tone leads to plasticity in the auditory cortex map of tone frequency. These effects have already been used clinically to reverse pathological plasticity in the auditory cortex to treat tinnitus50. Similarly, repeated pairing of VNS with a motor behavior has been shown to reorganize motor cortex8 and this targeted plasticity is highly effective in the recovery of function in different animal models of stroke9,10. However, delayed VNS delivered 2 hr after rehabilitative training sessions or several-fold larger amounts of VNS resulted in comparatively less improvement than precisely timed VNS51. Thus, future studies need to optimize both the timing and the amount of VNS to maximize therapeutic benefits. Our results show that VNS, which is clinically approved for the treatment of multidrug-resistant epilepsy and treatment-resistant depression, could be used as an adjunct treatment to exposure therapy because it modulates learning-specific plasticity to enhance the effect of exposure on extinction of conditioned fear responding. The authors have no competing interests or conflicts. This research was supported by the National Institute of Mental Health MH 086960-01A1 (Christa K. McIntyre). Quirk, G. J., Mueller, D. Neural mechanisms of extinction learning and retrieval. Neuropsychopharmacol. 33, (1), 56-72 (1038). Milad, M. R., Orr, S. P., Lasko, N. B., Chang, Y., Rauch, S. L., Pitman, R. K. Presence and acquired origin of reduced recall for fear extinction in PTSD: results of a twin study. J Psychiat Res. 42, (7), 515-520 (2008). Jovanovic, T., Norrholm, S. D., Blanding, N. Q., Davis, M., Duncan, E., Bradley, B., Ressler, K. J. Impaired fear inhibition is a biomarker of PTSD but not depression. Depress Anxiety. 27, (3), 244-251 (2010). Norrholm, S. D., et al. Fear extinction in traumatized civilians with posttraumatic stress disorder: relation to symptom severity. Biol Psychiat. 69, (6), 556-563 (2011). Phelps, E. A., LeDoux, J. E. Contributions of the amygdala to emotion processing: from animal models to human behavior. Neuron. 48, (2), 175-187 (2005). Pape, H. C., Paré, D. Plastic synaptic networks of the amygdala for the acquisition, expression, and extinction of conditioned fear. Physiol Rev. 90, (2), 419-463 (2010). Engineer, N. D., et al. Reversing pathological neural activity using targeted plasticity. Nature. 470, (7332), 101-104 (2011). Porter, B. A., et al. Repeatedly pairing vagus nerve stimulation with a movement reorganizes primary motor cortex. Cereb Cortex. 22, (10), 2365-2374 (2012). Hays, S. A., et al. Vagus nerve stimulation during rehabilitative training improves functional recovery after intracerebral hemorrhage. Stroke. 45, 3097-3100 (2014). Khodaparast, N., et al. Vagus nerve stimulation delivered during motor rehabilitation improves recovery in a rat model of stroke. Neurorehab Neural Re. 28, (7), 698-706 (2014). Clark, K. B., Krahl, S. E., Smith, D. C., Jensen, R. A. Post‐training unilateral vagal stimulation enhances retention performance in the rat. Neurobiol Learn Mem. 63, (3), 213-216 (1995). Clark, K. B., Smith, D. C., Hassert, D. L., Browning, R. A., Naritoku, D. K., Jensen, R. A. Posttraining electrical stimulation of vagal afferents with concomitant vagal efferent inactivation enhances memory storage processes in the rat. Neurobiol Learn Mem. 70, (3), 364-373 (1998). Clark, K. B., Naritoku, D. K., Smith, D. C., Browning, R. A., Jensen, R. A. Enhanced recognition memory following vagus nerve stimulation in human subjects. Nat. Neurosci. 2, 94-98 (1999). McGaugh, J. L. amygdala modulates the consolidation of memories of emotionally arousing experiences. Annu Rev Neurosci. 27, 1-28 (2004). McGaugh, J. L., Roozendaal, B. Role of adrenal stress hormones in forming lasting memories in the brain. Curr Opin Neurobiol. 12, 205-210 (2002). Miyashita, T., Williams, C. L. Epinephrine administration increases neural impulses propagated along the vagus nerve: Role of peripheral beta-adrenergic receptors. Neurobiol Learn Mem. 85, (2), 116-124 (2006). Williams, C. L., Men, D., Clayton, E. C., Gold, P. E. Norephinephrine release in the amygdala after systemic injection of epinephrine or escapable footshock: contribution of the nucleus of the solitary tract. Behavioral Neurosci. 112, (6), 1414-1422 (1998). Liang, K. C., Juler, R. G., McGaugh, J. L. Modulating effects of post-training epinephrine on memory: involvement of the amygdala noradrenergic system. Brain Res. 368, (1), 125-133 (1986). Peña, D. F., Engineer, N. D., McIntyre, C. K. Rapid remission of conditioned fear expression with extinction training paired with vagus nerve stimulation. Biol Psychiat. 73, (11), 1071-1077 (2013). Peña, D. F., Childs, J. E., Willett, S., Vital, A., McIntyre, C. K., Kroener, S. Vagus nerve stimulation enhances extinction of conditioned fear and modulates plasticity in the pathway from the ventromedial prefrontal cortex to the amygdala. Front Behav Neurosci. 8, (327), (2014). Maren, S. Overtraining does not mitigate contextual fear conditioning deficits produced by neurotoxic lesions of the basolateral amygdala. J Neurosci. 18, (8), 3088-3097 (1998). Blanchard, R. J., Blanchard, D. C. Crouching as an index of fear. J Comp Physiol Psych. 67, (3), 370-375 (1969). Maroun, M. Stress reverses plasticity in the pathway projecting from the ventromedial prefrontal cortex to the basolateral amygdala. Eur J Neurosci. 24, (10), 2917-2922 (2006). Moussawi, K., et al. N-Acetylcysteine reverses cocaine-induced metaplasticity. Nat Neurosci. 12, 182-189 (2009). Paintal, A. S. Vagal sensory receptors and their reflex effects. Physiol. Rev. 53, (1), 159-227 (1973). Aalbers, M., Vles, J., Klinkenberg, S., Hoogland, G., Majoie, M., Rijkers, K. Animal models for vagus nerve stimulation in epilepsy. Exp Neurol. 230, (2), 167-175 (2011). Ricardo, J. A., Koh, E. T. Anatomical evidence of direct projections from the nucleus of the solitary tract to the hypothalamus, amygdala, and other forebrain structures in the rat. Brain Res. 153, 1-26 (1978). Takigawa, M., Mogenson, G. J. A study of inputs to antidromically identified neurons of the locus coeruleus. Brain Res. 135, (2), 217-230 (1977). Groves, D. A., Bowman, E. M., Brown, V. J. Recordings from the rat locus coeruleus during acute vagal nerve stimulation in the anaesthetised rat. Neurosci Lett. 379, (3), 174-179 (2005). Manta, S., Dong, J., Debonnel, G., Blier, P. Enhancement of the function of rat serotonin and norepinephrine neurons by sustained vagus nerve stimulation. J Psychiatr Neurosci. 34, (4), 272-280 (2009). Manta, S., El Mansari, M., Debonnel, G., Blier, P. Electrophysiological and neurochemical effects of long-term vagus nerve stimulation on the rat monoaminergic systems. Int J Neuropsychoph. 16, (2), 459-470 (2013). Dorr, A. E., Debonnel, G. Effect of vagus nerve stimulation on serotonergic and noradrenergic transmission. J Pharmacol Exp Ther. 318, 890-898 (2006). Follesa, P., et al. Vagus nerve stimulation increases norepinephrine concentration and the gene expression of BDNF and bFGF in the rat brain. Brain Res. 1179, (7), 28-34 (2007). Biggio, F., et al. Chronic vagus nerve stimulation induces neuronal plasticity in the rat hippocampus. Int J Neuropsychoph. 12, (9), 1209-1221 (1017). Nichols, J. A., Nichols, A. R., Smirnakis, S. M., Engineer, N. D., Kilgard, M. P., Atzori, M. Vagus nerve stimulation modulates cortical synchrony and excitability through the activation of muscarinic receptors. Neuroscience. 189, 207-214 (2011). Peters, J., Kalivas, P. W., Quirk, G. J. Extinction circuits for fear and addiction overlap in prefrontal cortex. Learn Memory. 16, 279-288 (2009). 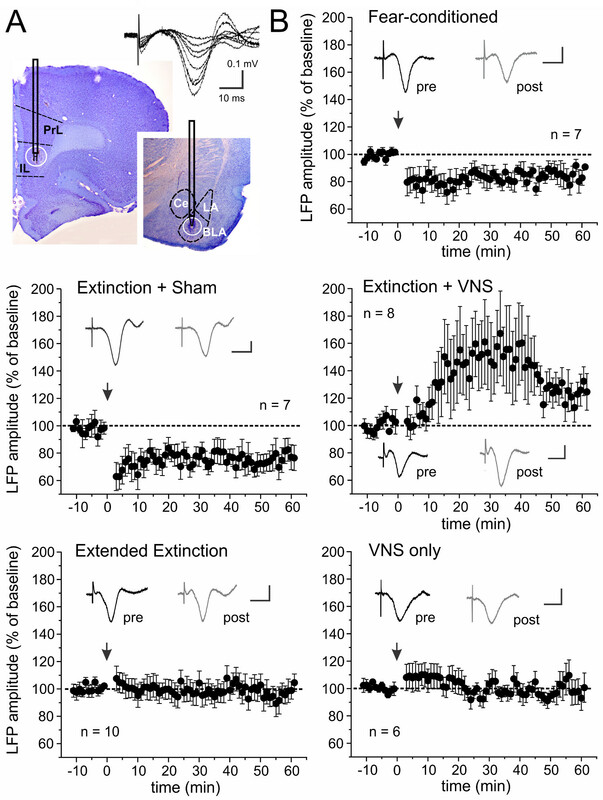 Ji, J., Maren, S. Hippocampal involvement in contextual modulation of fear extinction. Hippocampus. 17, (9), 749-758 (2007). Roosevelt, R. W., Smith, D. C., Clough, R. W., Jensen, R. A., Browning, R. A. Increased extracellular concentrations of norepinephrine in cortex and hippocampus following vagus nerve stimulation in the rat. Brain Res. 1119, (1), 124-132 (2006). Hassert, D. L., Miyashita, T., Williams, C. L. The effects of peripheral vagal nerve stimulation at a memory-modulating intensity on norepinephrine output in the basolateral amygdala. Behav Neurosci. 118, (1), 79-88 (2004). Ura, H., et al. Vagus nerve stimulation induced long-lasting enhancement of synaptic transmission and decreased granule cell discharge in the hippocampal dentate gyrus of urethane-anesthetized rats. Brain Res. 1492, 63-71 (2013). Zuo, Y., Smith, D. C., Jensen, R. A. Vagus nerve stimulation potentiates hippocampal LTP in freely-moving rats. Physiol Behav. 90, (4), 583-589 (2007). Shen, H., Fuchino, Y., Miyamoto, D., Nomura, H., Matsuki, N. Vagus nerve stimulation enhances perforant path-CA3 synaptic transmission via the activation of β-adrenergic receptors and the locus coeruleus. Int J Neuropsychophl. 15, (4), 523-530 (2012). Fibiger, H. C., Mason, S. T. The effects of dorsal bundle injections of 6-hydroxydopamine on avoidance responding in rats. Bitr J Pharmacol. 64, (4), 601-605 (1978). Mason, S. T. Fibiger H.C. 6-OHDA lesion of the dorsal noradrenergic bundle alters extinction of passive avoidance. Brain Res. 152, 209-214 (1978). McGaugh, J. L. Memory consolidation and the amygdala: a systems perspective. Trends Neurosci. 25, (9), 456-461 (2002). LaLumiere, R. T., Niehoff, K. E., Kalivas, P. W. The infralimbic cortex regulates the consolidation of extinction after cocaine self-administration. Learn Memory. 17, 168-175 (2010). Mueller, D., Cahill, S. P. Noradrenergic modulation of extinction learning and exposure therapy. Behav Brain Res. 208, (1), 1-11 (2010). Smith, R. J., Aston-Jones, G. α(2) Adrenergic and imidazoline receptor agonists prevent cue-induced cocaine seeking. Biol Psychiat. 70, (8), 712-719 (2011). Buffalari, D. M., Baldwin, C. K., See, R. E. Treatment of cocaine withdrawal anxiety with guanfacine: relationships to cocaine intake and reinstatement of cocaine seeking in rats. Psychopharmacol. (Berl). 223, (2), 179-190 (2012). De Ridder, D., Vanneste, S., Engineer, N. D., Kilgard, M. P. Safety and efficacy of vagus nerve stimulation paired with tones for the treatment of tinnitus: a case series). Neuromodulation. 17, (2), 170-179 (2014). Hays, S. A., et al. The timing and amount of vagus nerve stimulation during rehabilitative training affect poststroke recovery of forelimb strength. Neuroreport. 25, 676-682 (2014).